Whether you have birthday’s coming up, are planning a family gathering or are throwing a Valentine’s Day party this weekend and need some Valentine party food ideas, here are some great gluten free party snack recipes from Paulding & Company that your guests will be eating up! It doesn’t always have to be all about the kids. I usually post only kid friendly recipes, but my husband loves when I spice things up once in a while. Not to say kids won’t enjoy these, some kids have more adventurous paletes than others, but included is also every kids’ favorite, homemade ranch dip. Paulding & Company was founded by mother-daughter duo Terry and Tracy Paulding. Paulding & Co. is a commercial kitchen and instructional/event space that specializes in creating innovative event ideas for families and corporate entities through public cooking classes and exercises. Located in the heart of the San Francisco Bay area, Paulding & Company inspired Disney/Pixar animators for the Ratatouille film and director Clint Eastwood for several projects. Anyone who inspired Disney/Pixar must have something awesome going for them! I want to jot up to San Fran and take a cooking class at Paulding & Company! How fun would that be? I’m starting to daydream about my girl friends and I escaping to the city for a weekend and cooking some delicious food together. Before I get too off track, here are those party food recipes. Melt butter with some great hot sauce — again, pick your favorite (we use our home-grown Aji Lucento pepper sauce, which is VERY hot). Add enough hot sauce to really spice up the butter. If you want, you can also add a bit of sugar, but we don’t like to. Add salt to taste. Toss the popcorn with the sauce, and taste — it should be addictively good. Combine garlic, shallot and parsley in food processor. Pulse until well-chopped. Add remaining ingredients and whirl to combine well. You can make Cheddar Cheese Bread ahead, and freeze them un-baked. Just pop into the oven frozen, and serve hot. 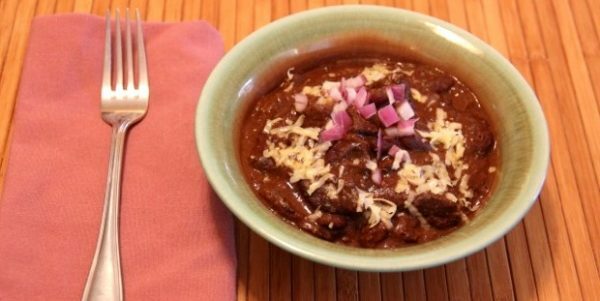 These are my interpretation, which is not quite as cheesy, and definitely not made with Cheddar — they go great with a bowl of chili, and are quite addictive. Doubling the recipe might be a good idea if you have more than a few guests. Preheat oven to 400°F. Cover a sheet pan with parchment or a silicone sheet. Gather all your measured ingredients by the stove. Combine the milk, water, butter and salt in a tri-ply or other evenly heavy pot. Bring to a boil. Remove from the heat. Pour in the tapioca flour, and using a heavy wooden paddle, beat until well combined and stiff. Add the egg, and again beat with the paddle until combined. Stir in the cheese. The dough will be stiff. Using an ice cream scoop or two tablespoons, drop oval (football shaped) mounds, about the size of a ping-pong ball, spacing them slightly away from one another. If making ahead, freeze, uncovered, and then transfer to a zip bag until ready to re-tray and bake. Bake 20 minutes. Enjoy warm; they keep for a day or so, but are best the day they’re made. Split wings, discarding tip piece. Combine remaining ingredients in a food processor. Marinate wing pieces for at least ½ hour. Preheat oven to 450°F. Lay wing pieces out on a parchment covered pan, bake until juices run clear, about 12 minutes. Heat half the oil to very hot in a large, non-reactive heavy-bottomed sauté pan. Add half the meat pieces, and let cook until the bottom is brown, without moving. Turn and let the second side brown. Remove that meat to a bowl, add more oil, and the remaining meat and brown it the same way. Be careful not to let the pan burn, as you want all the good flavors from the “fond” (which is the stuff that sticks) in the chili. Once the meat is brown, remove it and add onions to pan. Cook until limp and add garlic, seasoning well with salt and pepper as they cook. Continue to cook briefly, until garlic softens, and add all the spices. Stir for a minute until fragrant. Return the meat to pan. Add tomatoes and beer, and if you’re using it, the bourbon. Bring to a boil, turn down heat to very low, simmer until tender, and the flavors have melded, about 1 1/4 hours, stirring frequently and adding water if more liquid is needed. Add the beans and continue cooking for another 15 minutes, stirring frequently to make sure the bottom doesn’t burn. Adjust for salt and pepper. Serve hot, with chopped onions and grated cheese. All of these recipes sound amazing. I love the idea of homemade ranch dip on veggies so I’ll be creating this one soon. Carrots and Ranch are the best! We are planning a cookout for a family birthday and these treats will go well with my large extended family. 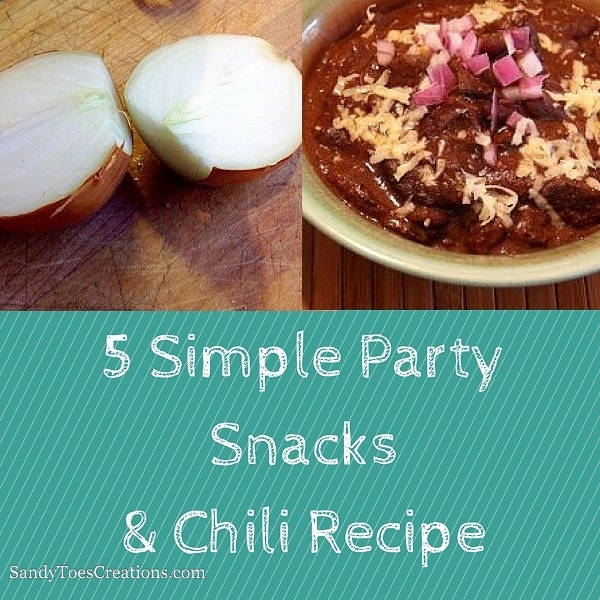 I’m all about simple party snacks…or maybe date night snacks! I am a popcorn addict, so I’ll definitely be adding some hot sauce to it next time we make some for movie night. I’m sharing these ideas on our Cooking With Kids page. So fun and easy for kids to help with!